For a camera company to grow in the future, it must acknowledge the world in which we now live in. Virtually none do, though a few now provide awkward ways of getting by. 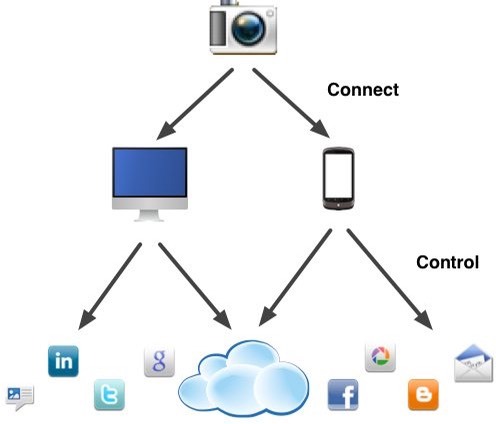 Communication — Modern devices communicate via WiFi, Bluetooth, or Cellular. A few other possibilities exist, and you have to looking ahead to foresee changes lest you get caught in a communication dead end, but those three are the basic choices. Moreover, these days that would be 801.11ac, Bluetooth 4, and LTE respectively. Bluetooth can probably now handle lots of photo transfer, but not everyone knows how to turn this capability on in their computer and the pairing that must be done up front can be awkward on some devices and problematic on reconnects. Most people already have and are carrying a cellular device, and the way contracts work, it's not likely that the majority of folk are going to want to tithe more to their local carrier for their camera. WiFi is ubiquitous at home, in the field, and on portable devices and well understood by consumers now, so WiFi is the most logical choice for a camera to communicate with the rest of the world. However, using WiFi would usually mean that you need an intermediary to get to the Internet when in remote places. For example, the day I first realized just what the future was going to look like with cameras was in July 2007 as I was sitting on the flanks of Kilimanjaro with my iPhone and realizing that I could send a summit picture to the world nearly instantly (Kilimanjaro is flanked with cell towers because that's what Tanzania decided was the best communication system for park rangers). But I could only do that instantly if I shot the picture with my brand new iPhone. Aha moment. My Kilimanjaro moment is still true today: the best way while traveling, even locally, to ensure that a photo gets to where you want it via the net is to send it through your mobile phone. So: camera to phone via WiFi, phone to Internet via cellular. A camera that doesn't have this built-in is not going to make it into the future very far. Isolated Case — I'm about to take my summit photo and I want it to go immediately to Facebook or my blog or Twitter or email to my family (the and case comes with multiple choice, below). Is there a "Send next photo to [choice]" button on my camera? Of course not. No one in Japan has realized it needs one, let alone how to program that problem. Likewise, there's another possibility: "Send previous photo or currently browsed photo(s) to [choice]." Nope, no UI for that, either. Also, because the smartphone in this instance is going to act as a conduit, you need iOS/Android/Windows/Blackberry apps that talk to the camera and perform the actual final bits of the process. So, you press the "Send next photo to [choice]" button, choose (if [choice] not already preconfigured), take your shot, and then. Hmm, lots of stuff needs to happen, doesn't it? You probably don't want to send 36mp down the cellular pipe every time you do this with your D800, so there needs to be a "Internet photo transfers should be resized to [choice]" function somewhere. The camera needs to see that and create the right image to pass through the WiFi pipe to the smartphone app along with the destination information, and the smartphone app takes the destination information and the photo and does the right thing with it. Worse still, all this has to be interruptible and recoverable. Maybe the smartphone isn't on. Or it loses the connection to the camera or the Internet along the way. So there has to be completion tokens that both the camera and app understand and react to. No smartphone detected? Incomplete transfer token. Smartphone suddenly detected? Initiate transfer sequence. While this all sounds simple, I remember working on this problem back in the early 90's with the Penpoint OS. 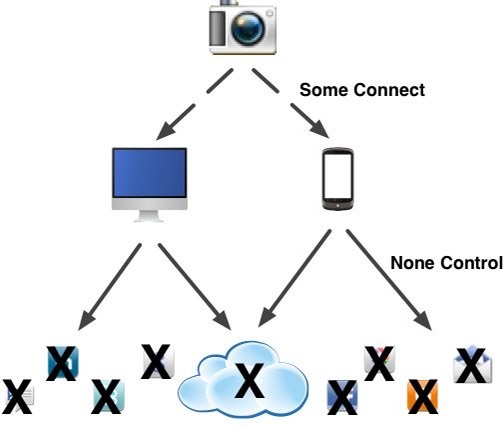 While we weren't thinking of photos specifically, the Penpoint OS understood cellular networks and could move files over them, and it could understand when the process was interrupted for whatever reason and automatically finish later when the connection was properly restored. It's actually a tough problem to solve, but it's definitely solvable. Batch — I'm shooting my goddaughter's graduation and want all the shots I don't immediately delete posted on an event page I've set up somewhere. See the two tricky problems here? "I don't immediately delete" is a wicked variable. How long does the camera or app wait until it decides it's okay to pass that image on? (An alternative is that I have to mark images to get passed on, a simpler problem.) And that event page, what is it, and how does it accept multiple images? The places you and I want our photos to go aren't controlled by the camera companies, and as you've just discovered if you tried my little experiment, even if they do have something, you don't want to use it. That means that the conduit app that sits on smartphone and the firmware on the camera need to be constantly updated to work with the top options most people are using: Facebook, Twitter, email, Flickr, Smug Mug, Google+, Snapchat, Instagram, and a dozen or so more. Oops. Constant updates. Know of any camera company that's doing that? Multiple Choice — What I, and I suspect you, really want is that we can control where everything goes in ways that are much more complex than the straight line option that all the camera makers' workflows give us. I want all my non-deleted images to end up in my photo storage, whether that be on my home computer or in the cloud, I want them organized by shoot and renamed so I can find them appropriately with basic OS tools. Everything I don't delete needs to end up there, and I don't want to have to do a long complex manual process to get there, nor do I want to have to remember to even do it. Seriously, in two decades of shooting digital there have been a few times where I just forgot to take the card out of the camera when I got home and download the images. That should not happen in the perfect future. But I also have other places I want things to go. I want my images backed up (probably in the cloud). I want select images to be isolated out so I can deal with (which means I need a way of selecting them at any point in the workflow, including at the camera). I want to browse images anywhere (camera, smartphone, image library in the cloud, on home computer) and send them, or smaller proxies of them, anywhere the Internet might let me send them. When I'm teaching, I might want to move images between cameras so that my student can see what I'm doing and I can see what they're doing. The actual workflow of images is no longer linear, no longer monolithic, and no longer simple. The future has to help me deal with that, not keep trying to make me do the same things I basically did with slide film. The smartphone makers are much further along this path than the camera makers. So much so, in fact, that many people simply prefer to use their phone instead of their camera for taking an image because it just lets them do things directly (e.g. send to Facebook). They're fine with lower quality—and by the time the image is downsized on a viewers' screen looking at the Facebook page, it might not actually look lower quality—and thus never pick up their dedicated camera. I even see workshop students on expensive tours to exotic places using the phones these days for the simple "around the camp" and "travelogue" type shots they want to share with friends. Here's the plane I took, here's the customs arrivals, here's my tent, here's my guide, etc. Why? Because it's more convenient. That's a condemnation of dedicated cameras that no Japanese camera executive should tolerate. A few camera makers are slugging along slowly at trying to do what I ask for above. Sony is building WiFi into most of their cameras now and has a nascent PlayMemories app for smartphones that attempts to do some minor lifting but then pulls a muscle trying. I think they've figured out the problem they need to solve. They just don't know the solution. Nikon makes the WiFi optional for most cameras, and their app is worse than Sony's. They seem to be not sure they know the problem that needs solving, and they certainly haven't stumbled on the solution. Samsung just decided to make the camera engulfing an Android smartphone inside. I don't want another cellular contract, thank you, and touchscreen isn't the way I want to control the camera, either. The problem is this: smartphones aren't frozen in stone. Their cameras keep getting better and better. We now have at least one with a 1/2.3" sensor and fast lens. The Nokia 41mp smartphones solve the zoom problem in an interesting way. Slowly, the camera capabilities get better and the need for anything less than a high-end DSLR becomes less necessary (which may be why Nikon has been concentrating so much on this lately; they realize that's the case and they haven't figured out what to do beneath that case). The camera that comes closest so far that I've tried is the Sony RX100II. Good shirt pocket camera with a larger sensor, good lens, solid controls, built-in WiFi, and some interesting options like the ability to use an EVF. The PlayMemories connection is there, though neither side (app or camera) comes anything close to where it needs to be. I suspect the RX10 will be of the same cut, only it's a larger camera that's definitely a neck strap camera. I'm rooting for Sony here, as they're the closest to the future right now, but boy oh boy do their programmers have a long way to go still.